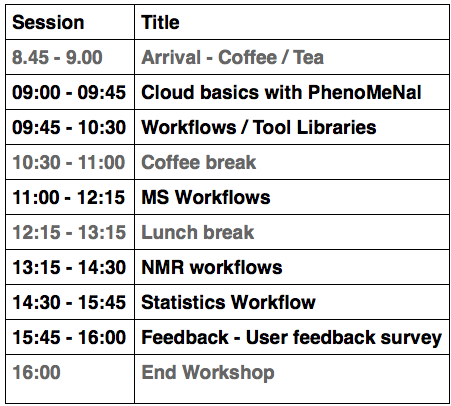 Following the success of our recent CloudMET and Metabolomic workflows courses, we are pleased to announce one more workshop (free admission!) on 14th December at Murray Learning Centre, University of Birmingham. This workshop will feature introductory lectures followed by practical sessions where you will be using the PhenoMeNal Gateway to run data-processing and analysis workflows. PhenoMeNal provides training and support to the user community by conducting workshops from time to time. What makes them special is that these workshop are completely interactive. The participants are given hands-on training and course material that you can followup after the workshop. They also have the opportunity to obtain guidance from our team and/or leave feedback via our help desk. What our participants have to say? To register click here. Admission to the workshop is free and we will provide free lunch and course material. If you are attending the MetaboMeeting 2017 visit us at our booth or contact us via our help desk.